2 rolls: 1 inch width, 10 yd long. Latex free. CVS Health pharmacist recommended. 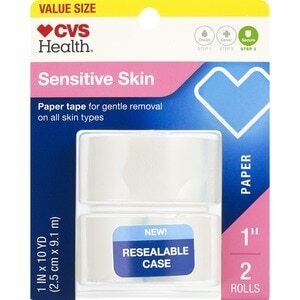 All about CVS Health first aid products: Non-Irritating Paper: Breathable and ideal when frequent bandage changes are required. 1. Clean: Stop bleeding by applying pressure with sterile gauze or cotton. Cleanse injured area gently and thoroughly with an antiseptic and water. Pat to dry. 2. Treat: Apply CVS Health First Aid Ointment. 3. Protect: Cover injured area completely with gauze pad or a non-stick pad to help absorb fluids. Tape sides to firmly secure gauze pad and help seal out dirt and germs.